C’mon! Really!? The leader of the free world can’t be bothered to click on spell-check before issuing a letter to the world’s leaders? How embarrassing. From the White House website found here, is an important letter from the President of the United States of America to the leaders of the most powerful nations in the world, to discuss the serious matters that will be covered by the upcoming G20 summit. Why is such an important letter, coming from the most powerful person in the world full of typos and misspellings? It’s horrendous. Trillions of dollars spent to support a bloated, overpaid government workforce and letters to the leaders of the world can’t even be proofread before they are published for the whole world to see. Forget proofreading…clicking one time on spell-check would have caught most of them. The President never bothered to read a letter “from him” to the world’s leaders. The President didn’t care about the typos. The President didn’t notice the typos. A lazy (and/or stupid) government stooge wrote and published a letter “from the President” to “the world” with no supervision or oversight. That’s it. It has to be one of those four. Any one of those is horrible. Aren’t you looking forward to this level of quality work when the government is running health care? Below is just a sample of the page. It’s been up since yesterday and so far, still horrendous. 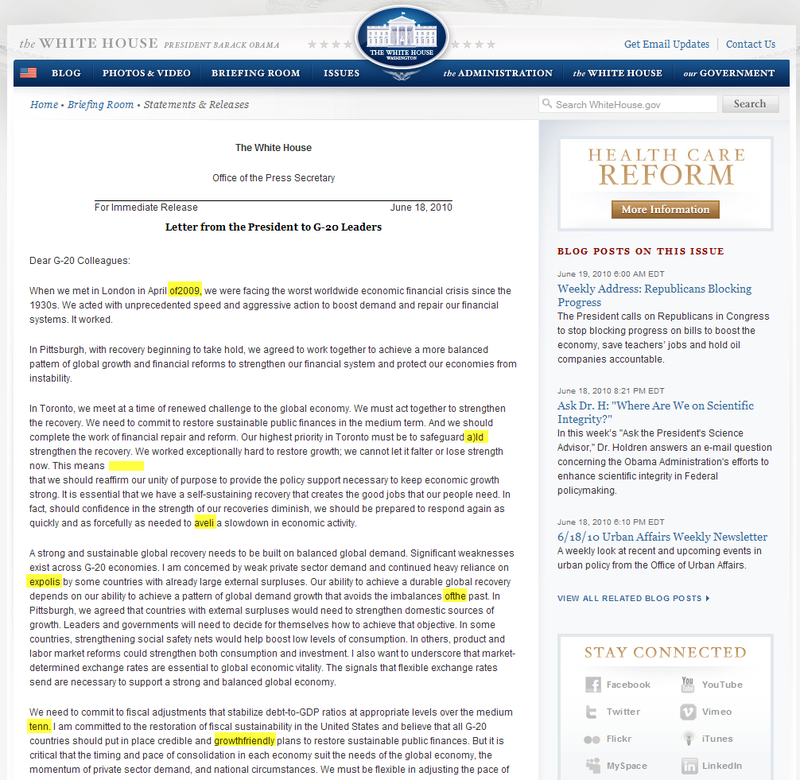 UPDATE: 10:30PM, June 19 – The White House website finally fixed the typos and provided a .pdf for download. I thought they might get around to it eventually, so my screenshot below is pre-pdf. 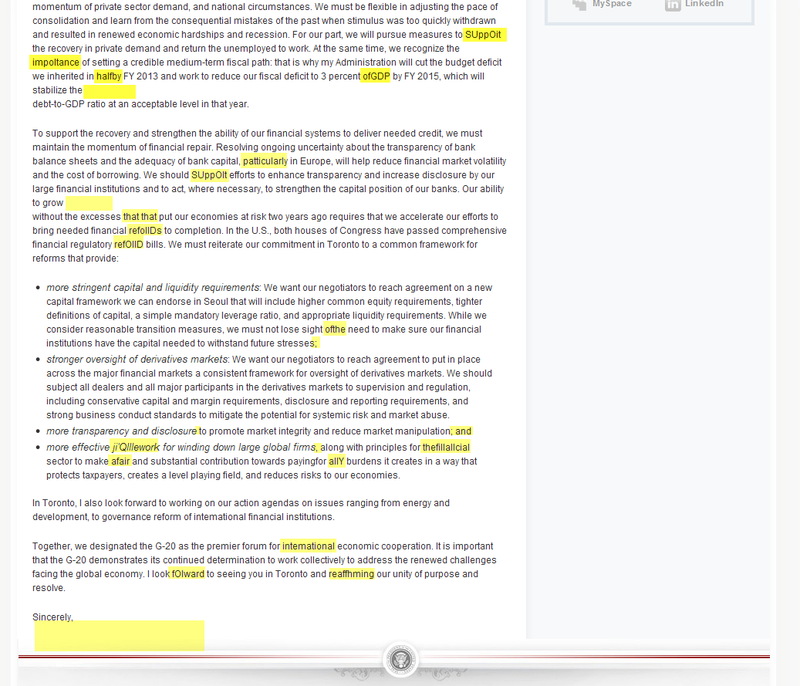 UPDATE: 11:00AM, June 22 – I added the second page of the G20 letter below in a second image.